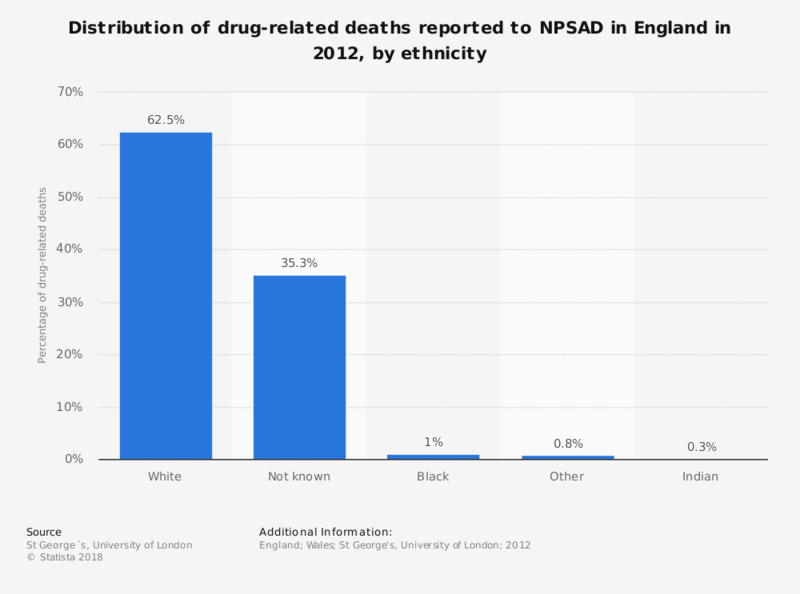 This statistic shows the amount of drug-related deaths, as reported to the National Programme on Substance Abuse Deaths (NPSAD) in England in 2012, by ethnicity. The majority of deaths where the ethnicity was known were those reported as being 'white'. There were, however, a large number of cases where the ethnicity was not reported. In 2012, there were a total of 1,147 drug-related deaths. National Programme on Substance Abuse Deaths (NPSAD) drug-related deaths are those deaths reported voluntarily to the NPSAD by coroners. Responses were voluntarily submitted from a total of 78 out of 99 coroners' jurisdictions in England, giving a total coverage rate of 78.8%.